John Dunsworth’s perpetually-drunk trailer park supervisor, Mr. Lahey, is one of the most brilliant TV characters I’ve ever seen. Though John was quick to credit his collaborators with assisting in the character development, one that was a long time in the making, the nuance and mastery was surely his. For a series so superficially nonsensical, the dialogues, jokes and characters of Trailer Park Boys are outstanding, a large factor in the show’s enormous and enduring popularity. Dunsworth’s Lahey stands atop that peak. Like a good stand-up bit, the hilarity of his character does not diminish with subsequent viewings, but grows more dynamic. The hour or so I was given to interview John, alongside Patrick Roach (Randy), in April of 2016 stands as one of my most cherished as a journalist. It was plain to see - John was just as remarkable in person as he is on-screen, albeit in a much different manner. In contrast to Mr. Lahey, John was even-keeled and sure-spoken. He was also, however, equally funny, in a drier fashion. Upon beginning our interview, I was delighted to hear that he really wasn’t interested in discussing his TPB character all that much, but rather his work in Haven - where he played the secretive reporter, Dave Teagues - his many years in regional theatre, politics, activism and the world at large. I remember my first impression being that he was clearly more of a theatre person than a feature film sort; he had more of an “artist” aura about him than “superstar”. He was incredibly observant, and seemed equally wise as Lahey is unhinged. The tributes and accounts from his collaborators, friends and family speak to these qualities and much more. Rest in Peace, John Dunsworth. Thank you for the endless laughs. These images were shot in April of 2016, during a live performance from John (Lahey) and Patrick Roach (Randy) at Summit Music Hall in Denver, CO. Billed as the 4/20 Cheeseburger Picnic. John comes from a very musical family, including his sister, Janet, who plays the violin with Symphony Nova Scotia. His performance with Randy was a bit rougher than theirs. The duo rolled out a number of "inventions" during the performance, including this smoke bag. "You can drive a school bus with this cocksucker." Another invention, with a purpose I cannot quite recall. "How many people would like to belong to the church of the bottle." Lahey holding an evening mass. 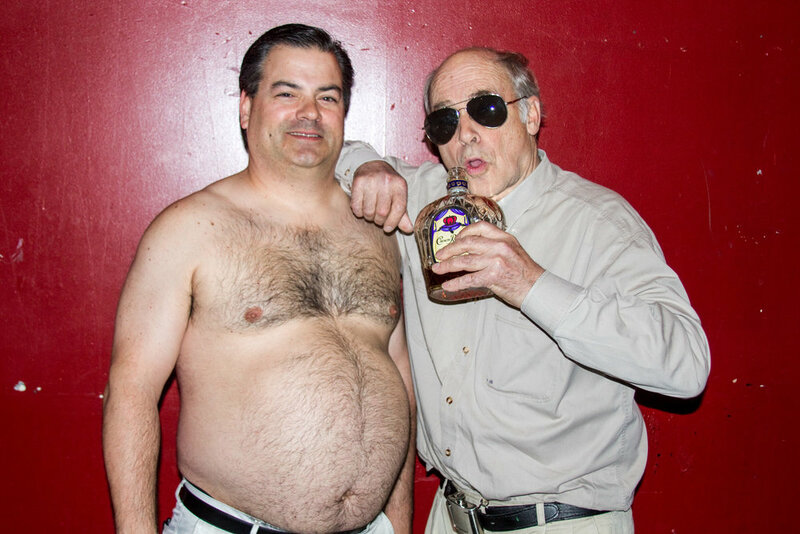 Though his character, Jim Lahey, often drank to a stupor in the show, John rarely drank alcohol. He said that when fans would ask him to drink with them, he'd often pretend to drink, or distract them with a laugh long enough for him to set it aside. Having a laugh with backstage amenities at Summit Music Hall. A favorite shot of mine - Lahey in his Orange hoodie.